Create a really good menu in seconds by picking a template or build any design from scratch in minutes. Instead of throwing away a few free templates to harvest your e-mail or ad-clicks, we are here to serve you professionally. Time is money. Save hours of modifying and debugging free CSS code samples. Just use Easy CSS Menu! Unlimited websites, full set of templates, no expiration, everything included. Priced from just $29.95, Easy CSS Menu is the best choice. If necessary, we will actually look at your website and consult you. Easy CSS Menu Free edition is fully functional but stripped-down version of our commercial CSS menu maker. Free version includes only 20 templates and limited features, but it is still usable for creating simple CSS menus. 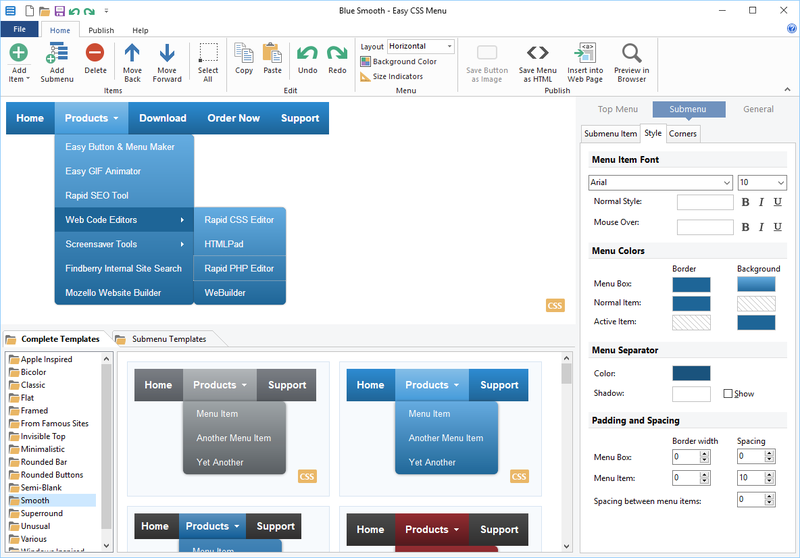 Easy CSS Menu Free edition does not include dedicated customer support and advanced features. Free version is for personal, non-commercial use only. Free edition serves also as an evaluation version for those customers who are ready to buy the full thing. Get Easy CSS Menu Free version!